Llandudno Town Hall was designed in 1894 and won a £50 prize for the architect, Mr. T. B. Silcock, of Bath, in a competition judged by a Mr. Lockwood, of Chester (who I presume was another Architect). It had been the wish of Llandudno Urban District Council (1895-1974)and its predecessors the Llandudno Improvement Commissioners (1854-1894), for the town to have a grand Town Hall, but the process of obtaining one was not to be smooth. The design was intended to be in the English Renaissance style but ended up as a Baroque form of Classicism, based on E. W. Mountford's design for Battersea Town Hall. Construction was of Portland stone, lined by red brick. The budgeted cost was £10,000 but problems started almost immediately when the lowest tender for construction received was for £13,300, from a Mr. Warburton of Miles Platting (a district in Manchester). This caused consternation amongst the Councillors and the debate about a revised design and cost rumbled on for many months. Eventually, a revised design and budget for £13,023 was accepted and Mr. Warburton was awarded the contract. The land it was to be built on was a gift from Lord Mostyn to celebrate Queen Victoria's Diamond Jubilee in June 1897 - he donated 1,798 Square Yards of land on Lloyd Street, valued at £4,044. But, another dispute arose and work still did not start. Mr. Warburton's contract was terminated and was awarded to a man called Robert Luther Roberts, who managed to actually get construction underway by 1899. 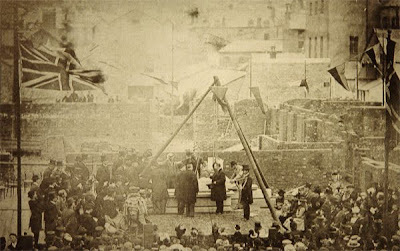 Lord Mostyn laid the Foundation Stone on the October 26th 1899 and the building was completed by early 1902. Unfortunately, by now the total cost had soared to £20,000. The building featured a large Assembly Hall on the Ground Floor designed for public use, together with associated offices and facilities. The central section of the First Floor was devoted to the Council Chamber, with municipal offices. One wing of the building was designed to be let to private businesses and was completely separated from the municipal part, having its own entrance. The front entrance opened into the Main Hall, complete with grand staircase of Devonshire stone, lined by marble columns. The building was officially opened by Sir Albert Rollitt (Chairman of the Association of Local Government Organisations and one-time Lord Mayor of Hull) on the 10th February 1902. It was a cold Winter's day and snow was falling heavily in Llandudno in the morning for Sir Albert Rollitt's arrival by train. Fortunately, the clouds cleared and the sun came out by late morning. After the official ceremony, several hundred guests attended a luncheon at 2.30pm in the Council Chamber. Catering was provided by a Mr. Alan Sumner of the Grosvenor Restaurant (is he the founder of the much loved Sumners restaurant that stood on Mostyn Street for many years, I wonder?). In the evening, a free concert for members of the public was held in the Assembly Hall, featuring local musicians & performers. The following Sunday, a special concert for the town's children was held. Ironically enough, one of the first official tasks undertaken in the new Town Hall was a Government inquiry into the cost of the project, which had more than doubled from the original estimate. Currently, the Town Hall is now owned by Conwy County Borough Council and Llandudno Town Council have to pay rent for their use of it. This seems curious to me - surely it should be owned by Llandudno Town Council, since it was their forerunner organisation that built it? In terms of design, I think the Town Hall suits its purpose perfectly. 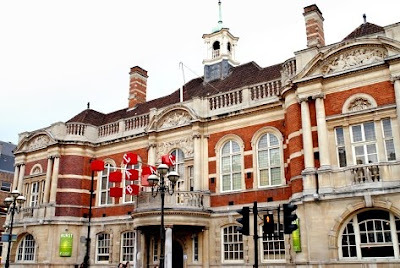 Looks familiar...but it's Battersea Town Hall! With a bit of refurb, a lick of paint and a few servants it would make a nice town house for me and my Byron, shame about the neighbours. Aint ya gonna comment on warra good idea that was of mine? Your posts ARE widely read and valued, even if most of us do not have a lot to add to them by way of comment. Thanks, Chris. Nice of you to say so. Have you run outta bleedin’ film for that there camera of yours? Get a sift on will ya. I'm with Chris on this one. This is one of the most informative local sites around and I do particularly appreciate the illustrations. For those who want to comment on local issues and to make their voices heard, there are several other sites catering especially for that type of reader. Keep up the good work Chameleon.